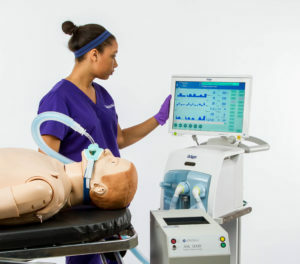 We recently spoke with Steve Hudson, Simulation Specialist at the Greenville HealthCare Simulation Center (GHSC) about GHSC’s experience with the ASL 5000™ Lung Solution for the Laerdal SimMan® platform. The GHSC is among the most sophisticated simulation-based learning and research centers in the United States, with 18,000 square feet of dedicated space. In fact, GHSC was one of the first 30 simulation centers in the world to be accredited by the Society for Simulation in Healthcare (SSH) in 2012. IngMar Medical: What challenges do you face and how is the Lung Solution for the Laerdal SimMan® platform helping you to solve them? Steve Hudson: In the Greenville area we have a serious problem with opioid addiction. To be able to simulate the impact of an overdose on respiratory function is a huge benefit. The ASL 5000 Lung Solution provides an integrated system that allows us to provide an excellent simulation experience for our students. Since implementing the Lung Solution, our internal customers have quickly adopted the system, particularly EMS services. IngMar Medical: How has the ASL 5000 Lung Solution been received at your facility? Steve Hudson: We’ve gotten a lot of requests to use the Lung Solution. Because of its ease-of-use and ability to simulate almost any spontaneously breathing patient, the new system has given our internal customers options that they did not have before. IngMar Medical: What is unique about the ASL 5000 Lung Solution? Steve Hudson: The ability to minutely adjust the parameters of the patient scenarios and simulate a spontaneously breathing patient. IngMar Medical: What makes the Lung Solution valuable to your program? Steve Hudson: We cannot simulate spontaneous breathing minutiae without the ASL 5000 Lung Solution. In the past there was only a very limited number of settings available. The system is very functional, and very easy to learn. IngMar Medical: Was it easy to implement the Lung Solution? Steve Hudson: Yes. Since we already had an ASL 5000 and multiple SimMan manikins, all we needed was the Lung Adapter and LLEAP software plugin to complete our system. We worked with both Laerdal and IngMar to obtain these missing pieces. Once we received them, we were up and rolling with a complete Lung Solution system in about 15 minutes! Our ASL 5000 Lung Solution seems to be one of the most popular portions of our respiratory program, as the Flight Medics, Critical Care Medics, and EMS have used it almost weekly! Steve Hudson, Simulation Specialist at the Greenville HealthCare Simulation Center, Greenville, SC. Learn more about the Lung Solution for the Laerdal SimMan® platform.